After the scandal surrounding the resignation of Paul Wolfowitz, the World Bank is now looking to safe, experienced hands in its new choice of leader. No stranger to high-profile positions, the 53-year-old Robert Zoellick spent nearly 18 months as deputy secretary of state, where he was number two to Condoleezza Rice. When he left the job in June last year, to take an executive role at the investment bank Goldman Sachs, Ms Rice described him as her "alter ego", praising his "tireless work ethic" and saying his efforts had made the US "stronger and safer". A Washington insider told the BBC that Mr Zoellick was "charmless and prone to tirades" but that he "had mellowed as he had risen in political life". Perhaps foremost on the minds of the Bank, given the Wolfowitz affair, is that it can ill-afford more negative headlines. Mr Zoellick is not prone to scandal. 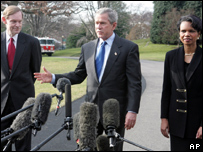 His experience in government makes him " a known quantity" who campaigned "aggressively" for Bush in 2000 and was loyal to him during his six years inside the Bush administration, the source said. Mr Zoellick also served as chief of staff to President George H.W. Bush. The World Bank is responsible for promoting economic development and reducing poverty. And his international reputation and relationships with many key players in the international economy leave him well-placed for the role, the source said. During his six years in the Bush administration, he led talks with Sudan over the violence in Darfur region as well as in Washington's dealings with China - issues which left him "widely respected". 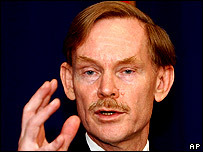 Before becoming Ms Rice's deputy in early 2005, Mr Zoellick was a former US trade representative who helped start the first round of Doha trade talks. Perhaps importantly in the global arena, the source said, he carries no baggage from the on-going disarray in Iraq, the continuing Achilles heel of US and indeed World politics. Described as an enthusiastic advocate of free trade and an internationalist with a broad range of foreign contacts, the Harvard-trained lawyer completed negotiations to bring China and Taiwan into the World Trade Organization. "Bob Zoellicks's experience and long career in international trade, finance and diplomacy make him uniquely prepared to take on this challenge", a government source told the AFP news agency. "He has the trust and respect of many officials around the world and believes deeply in the World Bank's mission of tackling poverty." While the head of the World Bank has historically been an American, there have been calls from some member countries to consider candidates from elsewhere - with British Prime Minister Tony Blair even being talked about as an outside contender. However President Bush insisted he wanted a US citizen in the top job at the bank and Mr Zoellick was his choice. Reports suggest that Treasury Secretary Henry Paulson, himself a former Goldman Sachs executive, had received "positive reactions" from other World Bank member nations to the choice. However some health and environmental groups are among those highlighting parts of Mr Zoellick's career which they feel do not fit in with the role of the World Bank. Executive Director of the Global AIDS Alliance, Paul Zeitz said that Mr Zoellick "has been a close friend to the brand-name pharmaceutical industry". "The bilateral trade agreements he has negotiated effectively block access to generic medication for millions of people. "He has no significant experience in economic development in poor countries and from a public health standpoint, Zoellick is a terrible choice for World Bank President." And Greenpeace International, citing Mr Zoellick's role in a US legal challenge to European restrictions on biotech crops and foods, said: "Once again Bush has put loyalty ahead of merit."